Germany - IOM’s Global Migration Trends Factsheet 2015 presents a snapshot of the migration trends worldwide for the year 2015, based on migration statistics from a variety of sources. As a share of the world population, however, international migration has remained fairly constant over the past decades, at around 3 percent. While female migrants constitute only 48 percent of the international migrant stock worldwide, and 42 percent in Asia, women make up the majority of international migrants in Europe (52.4 percent) and North America (51.2 percent). South-South migration flows (across developing countries) continued to grow compared to South-North movements (from developing to developed countries.) In 2015, 90.2 million international migrants born in developing countries were living in other countries in the Global South, while 85.3 million born in the South lived in countries in the Global North. Germany became the second most popular destination for international migrants globally (in absolute numbers), following the United States and ahead of the Russian Federation, with an estimated 12 million foreign-born people living in the country in 2015 (compared to 46.6 million in the US and 11.9 million in the Russian Federation). As a proportion of the host country’s population, however, numbers of international migrants continue to be highest in the Gulf Cooperation Council countries. The foreign-born population makes up 88.4 percent of the total population in the United Arab Emirates, 75.7 percent in Qatar and 73.6 percent in Kuwait. The year 2015 saw the highest levels of forced displacement globally recorded since World War II, with a dramatic increase in the number of refugees, asylum-seekers and internally displaced people across various regions of the world – from Africa to the Middle East and South Asia. The world hosted 15.1 million refugees by mid-2015. This is a 45 percent increase compared to three and a half years ago, largely due to continued conflict in the Syria, now well into its fifth year. Some five million people were newly displaced in the first half of 2015. In 2015, Germany also became the largest single recipient of first-time individual asylum claims globally, with almost 442,000 applications lodged in the country by the end of the year. The number of asylum claims worldwide almost doubled between 2014 and the first half of 2015, from 558,000 pending applications by the end of 2014 to almost 1 million in June 2015. By the end of 2015, the EU as a whole received over 1.2 million first-time asylum claims, more than double the number registered in 2014 (563,000), and almost double the levels recorded in 1992 in the then 15 Member States (672,000). The increase in 2015 is largely due to higher numbers of asylum claims from Syrians, Afghans and Iraqis. Almost 1 in 3 first-time asylum applicants in the EU were minors, an 11 percent increase compared to 2014 levels. Almost 1 in 5 of these were judged to be unaccompanied by national authorities – the highest number since 2008 and a three-fold increase on numbers registered in 2014. Still, the vast majority of refugees continue to be hosted by developing countries, particularly those that are close to the refugees’ countries of origin. For example, the bulk of the Syrian refugee population is hosted by Turkey (2.2 million), Lebanon (1.2 million) and Jordan (almost 630,000), according to figures recorded in December 2015. Also, most forced displacement globally still occurs within countries’ borders, with an estimated 38 million people internally displaced by conflict and violence at the end of 2014 – from Iraq to South Sudan, from Syria to the Democratic Republic of the Congo and Nigeria. 2015 was also the deadliest year for migrants: increased levels of forced displacement globally were tragically accompanied by record-high numbers of people perishing or going missing while trying to cross international borders. Over 5,400 migrants worldwide are estimated to have died or gone missing in 2015. According to IOM’s Missing Migrants project, migrant fatalities during migration to Europe increased by 15 percent compared to the previous year, reaching at least 3,770. From 2014 to 2015, a major and sudden shift in routes of irregular migration by sea to Europe occurred. 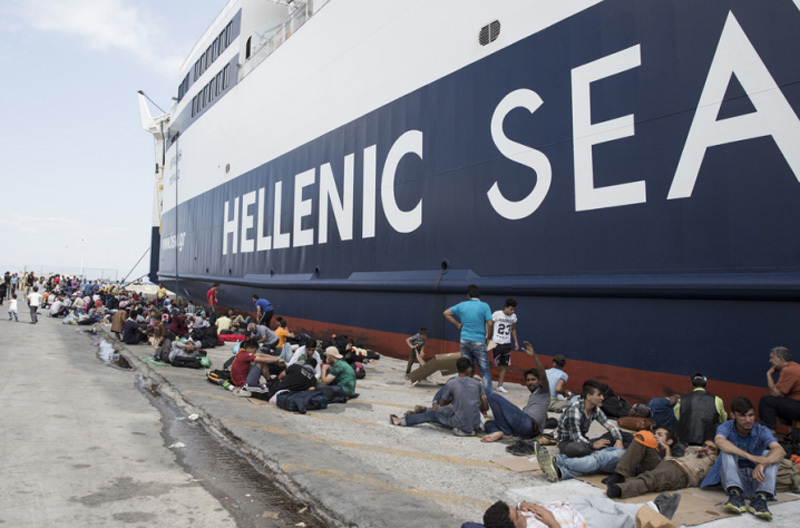 About 853,000 migrants arrived in Greece in 2015, compared to 34,400 in 2014. Almost 154,000 arrived in Italy in 2015, compared to 170,100 in 2014. In 2015, the number of voluntary returns of migrants (including failed asylum-seekers and others) from EU countries was for the first time higher than the number of forced returns (81,681 compared to 72,473). The number of IOM-assisted voluntary returns from EU Member States, Norway and Switzerland in 2015 reached almost 56,000. Remittances continue to climb globally, while remittance-sending costs remain relatively high. The sum of financial remittances sent by international migrants back to their families in origin countries amounted to an estimated $601 billion in 2015 – over two thirds of which were sent to developing countries. In Tajikistan remittances constituted over 40 percent of the country’s GDP. However, average remittance transfer costs were still at 7.5 percent of the amount sent in the third quarter of 2015, higher than the 3 percent minimum target set in the Sustainable Development Goals to be met by 2030. Remittance transfer costs are particularly high in Sub-Saharan Africa – now standing at 9.5 percent on average. Finally, public opinion towards migration globally is more favourable than commonly perceived – with the notable exception of Europe, according to an IOM-Gallup report “How the World Views Migration”. The report is based on a Gallup poll conducted across over 140 countries between 2012 and 2014.